We actually perceive and experience the world through the mind. Our mind is nothing but a collection of thoughts, which have the ‘I thought’ as the primary thought. The ‘I thought’ is an impostor that springs from Consciousness donning the appearance of Consciousness, which is the REAL I. If but for the thoughts, there is no such thing called the mind, states Ramana Maharshi. In deep sleep, the mind is lost along with the world, but when we wake up, the individual self (identification with the body and the mind), or the ‘I thought’ rises after which we begin to experience the world for the day. When we view the world as the individual self or the ‘I thought’ in the waking state, we look at it as different from us. From this standpoint, we all look at the world as something apart from us. The world from our understanding is people, situations, things etc all put together. When the world is looked at something apart from us, it seems as if it has a control on ourselves, our actions, in short on our lives. This truth is actually within the experience of all. Hence, when looked at as apart from us, there arises duality, multiplicity, comparison and as a result misery. To add to the argument of the illusory world, the world that we call the real in the waking state is completely lost in the deep sleep state. This is because the ‘I thought’ also is lost in the deep sleep state. In the dream state, we are in a different world or plane altogether. Therefore, the world is a seeming condensed form in the ‘I thought’; with different forms in the waking and dream state and being lost in the deep sleep state. Furthermore, when the ‘I thought’ is not the real ‘I’, how can the world and the experiences perceived through it be real? Therefore, with the illusory ‘I thought’ it is just an ‘illusory world’. However, there is a seeming paradox. The world can be true too! 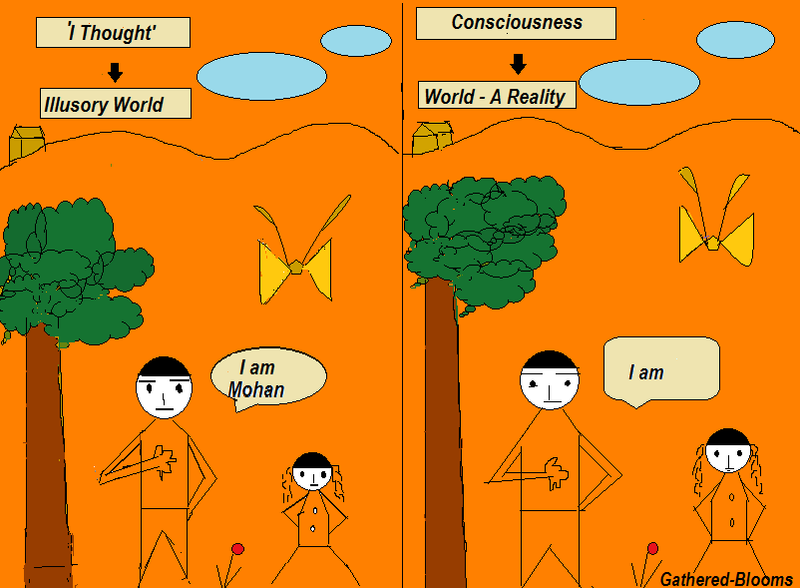 Vedanta states that the world is real too. When we look at the world from the standpoint of the Self, our Pure Being or Consciousness, the world is real. The pure being or consciousness is the base from which the ‘I thought’ arises and experiences the world and subsides in the deep sleep state. Consciousness is the uniform underlying reality for all the three states. The three states are mere appearances on it. Hence, the world is also but a mere appearance in Consciousness. However, the world, is not apart from the base (the Self, Pure Being or Consciousness), like that of the apparent pictures on a screen. The objects of the world are manifestations of Consciousness, as they have it for their base and hence infused with it, like the clay in the pot. The world is not separate from one’s own self, Consciousness. The Seer, the Seen and the act of Seeing, all become one, not apart from one another. When we stabilize in this ‘Oneness’ the misery of the world is negated. This can be realized through consistent Self enquiry and meditation. When the shift in the identity of ourselves from the ‘I thought’ to Consciousness is realised, the world is also nothing but consciousness. When the focus is on Consciousness, all the seeming manifestations or objects are nothing but the one Consciousness or pure being. Thus, the illusory world from the standpoint of the ‘I thought’ is but reality or Consciousness when stabilized in Consciousness.